The Goulash Collective - count me in! Well, we've done it! 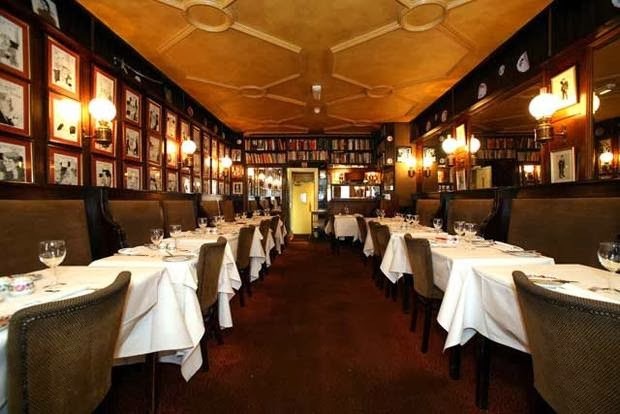 Steve and I have signed-up to a collective of Socialists, trades unionists, lefties, artists, writers and Marxists who have formed a group to try and save one of my favourite restaurants, The Gay Hussar. I must say, I did wince when I saw the list of those leading the bid and who will be on "the board"; Bill Hegarty (former Editor of the Daily Mirror), Chris Kaufman (Trades Unionist and Chair of Enfield Alliance Against The Cuts), Julia Langdon (Guardian Political Editor), Mark Seddon (journalist and former member of Labour's NEC) and Tom Watson MP. Having said that, I suspect none of the above are too keen about accepting investment capital from the likes of me and Iain Dale - but that's life! Anyway, should anyone wish to join-in to help save this truly wonderful institution, the minimum investment of £500. Not a fortune to help save one of Soho's culinary treasurers and an important piece of our political history. The full roll of honour (from left) Cllr Roger Dalton, Jacques Arnold, Cllr Brian Luker, Richard Long CC, Tashi Bhutia, Cllr Matthew Balfour, Cllr Ann Kemp, Bobbly Barnes, Cllr Tony Sayer, Cllr Nicolas Heslop, Cllr David Brake, Stuart Murray, Andrew Kennedy, Cllr Pat Gulvin, Tom Tugendhat, Cllr Adrian Gulvin, Cllr Sue Murray, Cllr David Trice, Cllr Chris Brown, Cllr Sophie Shrubsole, Cllr Russ Taylor, Cllr Jeannett Bellamy, Mike Franklin, Jon Botten, Dave Street, Kathy Doody (and Cllr Edmund Hastie taking the photograph). Twenty eight volunteers braved biting cold wind for the first Borough Green & Long Mill Campaign Day. Local campaigners from Tonbridge & Malling were joined by friends and colleagues from across the West Kent Group - with additional volunteers from Chatham & Aylesford and Tunbridge Wells. Our local candidate, Stuart Murray, who has lived in the area for over 30 years, is pictured above centre, standing alongside PPC Tom Tugendhat. Between the team, we delivered a leaflet to every one of the wards 3,000 houses and canvassed a further 500 properties! Tonight's meeting of the Tonbridge & Malling Executive Council voted unanimously in favour of the new West Kent Grouping, putting in place the fourth and final piece of the jigsaw. All three of the original West Kent constituencies have now voted in favour, as have Maidstone and the Weald, who applied to join the Group a few months ago. They will now be with us from day one, when the new Campaign HQ is opened early next year. unanimously in favour of the West Kent Group at its meeting earlier this evening. It is worth noting that three of the four Associations voted to support the plans unanimously with the fourth supporting the proposals by 8:1. Even the three members who voted against did so on points of detail rather than opposing the principle. I have never known a Group of Associations demonstrate such willingness to work together for the benefit of the Conservative Party. I am already receiving calls and emails from nascent groups across the UK who are keen to emulate what we have done locally. It is an exciting time, for the Associations, the newly elected West Kent Executive and the staff, as we work together to bring four Associations under one roof, in a purpose built office, with full disabled person access, on-site parking, a new print facility and integrated VOIP Phone Bank. I am sure there will be hiccoughs and difficulties along the way, but I am confident that provided we are retain a sense of humour and remember the sense of goodwill that has enabled us to get where we now are, then we will not only go from strength to strength, but flourish and grow together. If any readers are around Tunbridge Wells on Saturday 7 December, do stop by and say hello! I first went to the Gay Hussar about fifteen years ago, and it rapidly established itself as one of my favourite London restaurants. I liked its lack of airs and graces and the maître d's complete disinterest in extracting additional revenue from his customers. I appreciated its workmanlike atmosphere and its focus on traditional cooking rather than style and presentation. I relished being in such a political atmosphere, even if the politics weren't my own; the walls lined with Martin Rowson cartoons and first editions of the great political biographies. I even enjoyed the almost inevitable probability of eating your goulash alongside a dinosaur of the Labour Movement, over the years I have found myself sitting alongside (and often chatting happily with) Michael Food, Tony Benn, Ken Livinstone, Frances Chambers and Jeremy Corbyn. Perhaps it was the death of the old Labour movement which precipitated the demise of the Gay Hussar - with Nu-Labour's apparatchiks preferring the soulless simplicity of The River Café to match the soulless simplicity of their political roots. Over the years I have dined there with friends, colleagues and political co-conspirators. I recall taking CCHQs Chris Scott there for lunch to discuss how West Kent could help in the Boris re-election campaign. I organised my best friends Stag Night dinner in the private upstairs dining room, 12 of us sitting around the same table as Nye Bevan and Jenny Lee once did. On one occasion I lunched with friends on the same day that Decanter Magazine were there to write an article on Hungarian wines. We were asked by the maître d' if we objected to having our photograph taken, which might then be published. We didn't mind at all, but when the magazine was published we weren't in it. 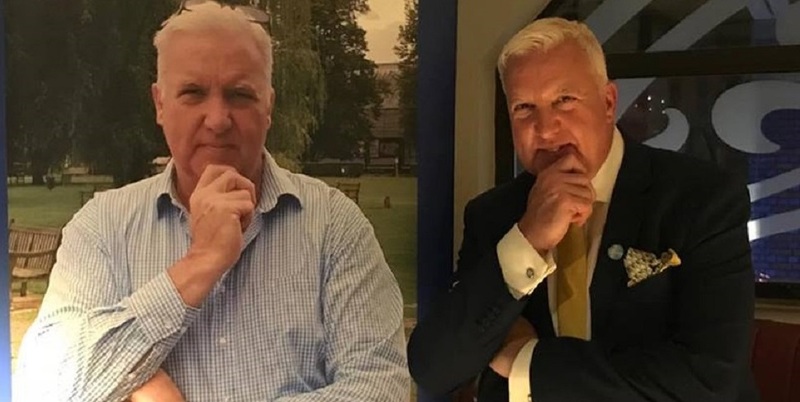 I thought nothing more until six months later when I received an email from an colleague, "Just been onto the Gay Hussar website to book a table - only to find four photographs of your ugly mug stirring back at me. Enough to put my off going. Urgh!" I hurriedly logged on and there I was - spread like a attention seeking d-list celebrity across every web page and in various states of mastication. The photographs were there for three or four years but were taken down when the new website was launched; I am grateful however to their webmaster for sending me the screengrab (above). The lady next to me is one of my oldest friends from Southampton, Ben Davies. And, for the record, I still have and occasionally wear that tie! For some reason, and I don't know why, I stopped going about two years ago. I didn't make a decision to stop going there - it just sort of happened. I suspect my increased responsibilities and workload in Kent resulted in fewer long lunches in Soho. And now, according to the press, the Gay Hussar has fallen victim to the Age of Austerity. Earlier today Steve called me from the car. He was listening to Iain Dale on LBC, who was interviewing someone (he couldn't remember who) who was putting together a consortium of private investors to buy the lease and keep it open. So we have emailed to say, "count us in." The sums are small and it's worth a punt to save a piece of history. And if all else fails, it will be lovely to walk past in years to come, point to a shiny new branch of YO! Sushi and say, "that was once the Labour Party's staff canteen, and I owned a small piece of it." On Saturday 18 January, the Association will be showcasing one of Britain's foremost magicians, who not only is a home-grown talent (he lives in Kings Hill) but is also an active member of the Conservative Association. Jonathan Shotton is the winner of the British Champion of Magic Award and has recently returned to the UK having worked abroad on cruise ships and in Las Vegas. He recently worked JK Rowling and is widely regarded as one of the best talents in the worlds of magic and illusion. You can see a short video clip of Jonathan performing in the window of Hamleys Toy Shop in Regent Street below. 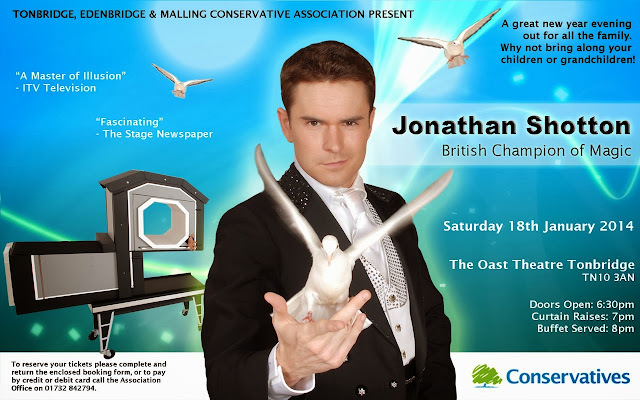 Jonathan has kindly agreed to host an evening of Enchanting Magic to help raise funds for the Conservative Association. This is a new and exciting venture for us but also a fabulous opportunity to brighten up the New Year for members and perhaps their children and grandchildren too. The show will be held at the Oast Theatre, Tonbridge on Saturday 18 January 2014. Doors will open at 6.30pm (and the Oast Theatre bar will be open for drinks). Guests will take their seats in the auditorium at 7pm for a spectacular magic show. This will be followed a 8pm by a two course buffet. Tickets are just £20 per person (inclusive of the show and buffet). During the buffet, Jonathan will be performing close-up table magic for all guests. There is a reduced rate of just £15 for children aged 15 or below. The quickest and simplest way to reserve tickets is to phone the office with your credit or debit card. The number is 01732 842794 (card bookings are subject to a 50p booking fee). Alternatively, send a cheque (payable to T&MCA) to 91 High Street, West Malling ME19 6NA. Please write "Magic Show" on the reverse of the cheque along with your name and address so we can forward your tickets. Please do book early as we anticipate there will be high demand for this event. Tunbridge Wells Town Centre has been blighted in recent years by two ugly "grot spots", which have been left empty by their owners. The first was the old Safeway supermarket by the railway station, the boarded-up facade of which provided an ugly greeting for residents and visitors. Thanks to a concerted campaign two years ago, led by Greg Clark MP and local Conservative activists, the site's new owners, Morrisons, redeveloped the site, which is now trading succesfully as a supermarket. 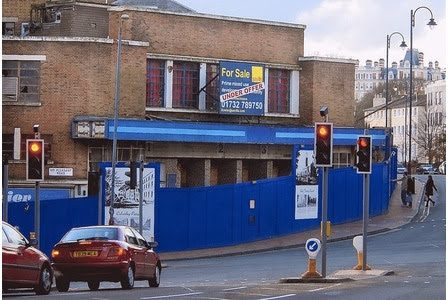 The derelict Cinema Site which has blighted Tunbridge Wells Town Centre for over 10 years. Photo courtesy of the Kent & Sussex Courier. The second "grot-spot" is the Cinema Site at the top of the High Street, directly opposite the Town Hall. This has been derelict for over 10 years and is a real blight on the town centre. Ownership of the site has passed between various pension funds and developers, and many believe too much money was paid, making it an unattractive prospect for any redevelopment. Our petition calls on the owners to show "greater consideration for residents whose lives are blighted by this eyesore." It calls on the co-owners "to demolish the site pending redevelopment, for the benefit of the town, its residents, visitors and the local economy." You can assist by signing our petition by clicking the link below. If you live in Tunbridge Wells and would like hard copies of the petition for family, friends and neighbours, email us at twconservatives@gmail.com and we will gladly send you hard copies. "I shall withold my subscription" he said, with all the pomp he could muster. Last Friday (22 November) I hosted my third fundraising event in three weeks, the combination of which has raised around £3,000 for party funds. None of these events were major high value dinners - they were all informal £10 - £14 pp suppers from which we provided food, paid for hall hire and covered all the related expenses. postage. E-tickets for attendees were returned by email also. 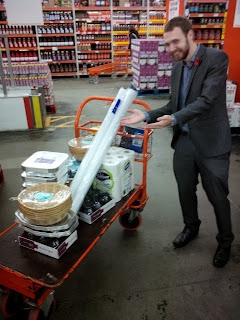 Catering for the event took me an hour pushing a trolley around Tesco and perhaps another hour displaying the six cheeses on platters and decorating them with grapes and celery. Good quality paper plates and wooden disposable knives meant no hire costs and washing-up. The wine (a decent Claret and a not too rough Chablis) came from the village off licence who also lent their glasses free of charge. 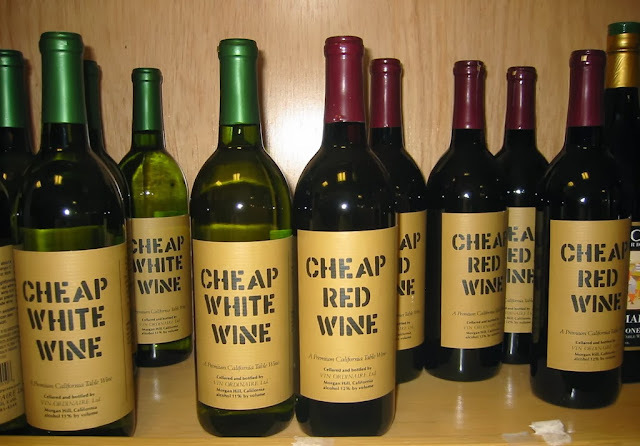 The provision of cheese and wine and hall hire cost £7 pp, leaving us £3 pp profit. 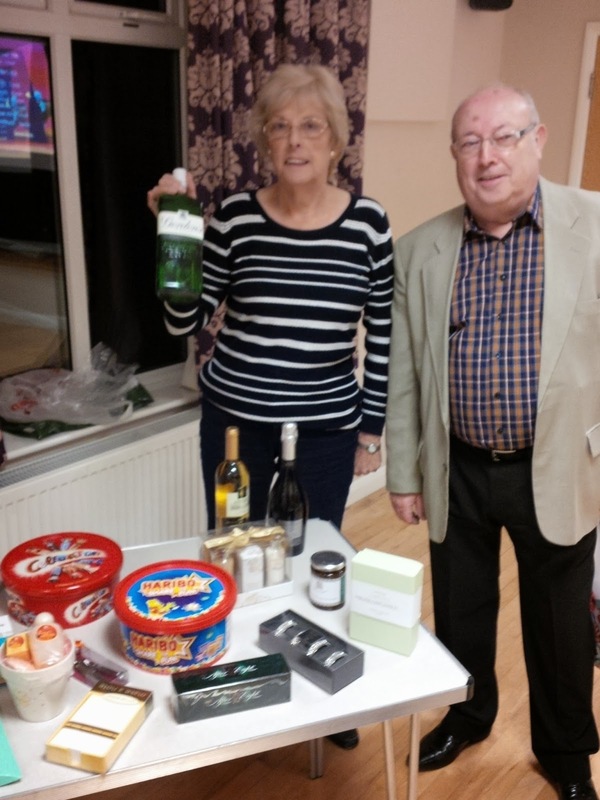 The ubiquitous raffle (ably run by Janet and Vivian) raised £170, and the sale of additional glasses of wine raised another £40. Result: £330 profit for what was perhaps 3 hours work. What's more - people enjoyed it. It lasted just over an hour - so everyone was gone by 8.30pm and we were cleared away by 9pm. The week before it was a Race Night for Chatham & Aylesford. Apart from help setting-up the room, I organised this single handed. This was just £12 per head, so £5 pp profit having paid for the fish and chips, hall hire and prizes for the race winners. The raffle proceeds and a share of the tote brought the profit to over £1,000. 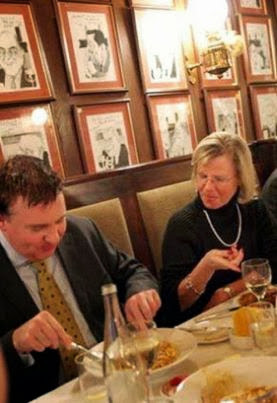 And the week before that it was an informal supper with Ann Widdecombe. Rather than pay caterers, I asked ten members, each of whom were coming to the event, if they would each bake a lasagne in exchange for a complimentary ticket. They all readily agreed and each brought a cooked lasagne with them (which we kept warm in the oven). Apart from halln hire charges, salads and puddings, everything was profit - another £1,300 for party funds. I have never found fund raising either difficult or arduous, yet listening to some branches you would think asking them to raise a few quid towards the Association's running costs was like asking them to knit with spaghetti or juggle red hot coals. Sadly, raising funds to pay the bills is a necessity - membership income covers just 25% of costs. The money has to come from somewhere. Some branches raise four-figure sums each and every year, whilst others haven't managed a penny in five years - and it's those who contribute least are usually the ones who have most to say at the Executive Council about how the money raised by others is spent! One branch sent details of a proposed Christmas dinner at a local gastro-pub. As I read the flyer I realised that it was outstanding value for money. Then I read on; they had invited not one but two Members of Parliament, both of whom had accepted but each unaware of the presence of the other. I then discovered why it was such good value - they were not charging full price as they expected the raffle to cover the shortfall! "So let me see if I understand...you are holding a fundraising dinner for 15 friends, selling tickets at a loss, and using the proceeds of the raffle to make up the shortfall. Not only that, you are expecting two MPs to give up a Friday evening just before Christmas to keep you entertained?" The organiser of the dinner didn't seem to think this was a problem. I explained that I had no issue with a group of friends holding a private dinner party, but using party funds to subsidise the cost and inviting two MPs under the false pretence that it was a fundraiser, was just not on. "I shall withhold my subscription in protest at your actions" announced the organiser, with all the pomp he could muster. "That's fine", I replied, "you haven't actually paid for two years". Today was the last ever meeting of Tonbridge & Malling Lunch Club, at least in its present format. Mrs Trish Robinson, who launched the Lunch Club in 1992, has retired; and after 21 years and nearly £25,000 raised for Association Funds, who can blame her? Sir John Stanley, Mrs Elizabeth Stanley, Miss Claire Browne, Mrs Trish Robinson, Dr Tony Robinson and Jacques Arnold. The Club has met six times a year for 21 years - with Trish presiding at each and every one of them. During those years Cabinet and Shadow Cabinet members, local Kent MPs, Council leaders, minor celebrities and leaders from the worlds of business, charity and the third sector have been invited to speak. About a 18 months ago I told Trish that I had been invited to address the Tunbridge Wells Ladies AGM. "Who'd pay to hear you?" she asked, with a degree of incredulity in her voice. Six months later, my summons arrived. I gently chided her for her previous comment and asked, "are you sure people will pay to hear someone like me...?" "Well". she replied, "the Easter luncheon is always poorly attended so I don't want to ask anyone important as it's embarrassing when only a few turn up." That put me in my place. My own indignities paled into insignificance however compared with the time she invited Association Chairman and former Gravesham MP, Jacques Arnold, to speak, Trish left guests in no doubt that all they were expected to provide was 10-15 minutes plus a further 10 minutes for questions. "Any more than that they will get restless and start to fall asleep". Jacques was in full flight and 20 minutes into his talk on the Hanoverians when Trish hauled herself to her feet, banged her teaspoon on the coffee cup and announced, "thank you, Jacques but I'm not sure we can take much more." Somewhat crestfallen, Jacques slumped into his Chair. "And don't even think about questions or we will be paying the staff overtime." Sadly, they don't make Tory women like Trish any more! Today's grand finale was rightfully addressed by Sir John Stanley, who was the very first guest speaker when the Club was formed in 1992. In the adjoining function room (separated only by a sliding screen) was a group named "Church Army Golfers for Jesus", who were singing between courses. As Sir John rose to speak Golfers for Jesus struck up "Shine, Jesus Shine". Sir John paid the warmest and most heartfelt tribute to a lady who had dedicate three decades of her life to the Conservative cause. To thank Trish for her work, the Association presented her with a bouquet of lilies and a gift of Afternoon Tea for Two at The Ritz. 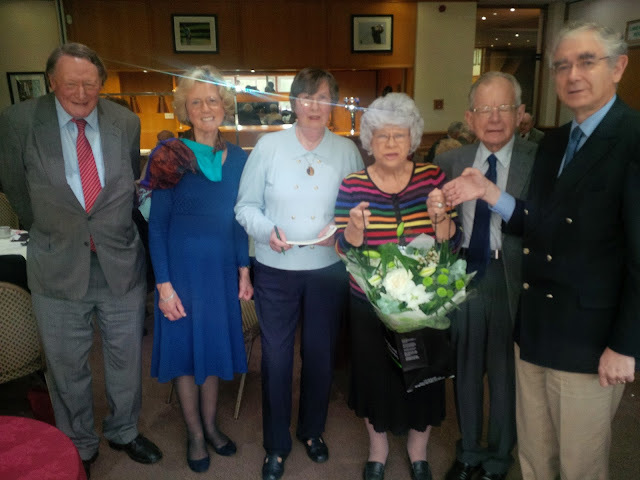 Her hard working Secretary, Miss Claire Brown, was also thanked with a presentation of flowers. It was right that the Luncheon Club came to an end today as Trish retired. This was Trish Robinson's Lunch Club as much as it was the Association's Lunch Club, and one without the other just wouldn't be right. You were kind enough to send through your Best Practice guide on running on a Conservative Draw a short time back. I’m just emailing to thank you again and report that I trialled it in two wards here (to prove the case to the Association) and it has been a resounding success. Our takings this year are easily going to double our previous best result and just as importantly we’ve been able to strike up a relationship with a decent number of non-members who are very supportive. Next year the association will go constituency wide with a hand delivered mailing to all pledges. This is one of many similar emails I have received on the Christmas Draw. One from an Association in the north who were about to give-up on the draw as it raised so little, but by following our Best Practice Guide they increased their income from £300 to over £2000. There is also good news from Chatham, Maidstone, Canterbury - all of which have substantially increased their income. The other evening when I addressed the Regional Chairman's Dinner at the Red Lion I said too many of our Associations have believed what they read in the papers and are simply managing decline. These good news stories demonstrate (and there are many more to come) is that we can turn things around, raise new money and increase our base of supporters - we just need to think about it differently. If you are an Association Officer or Organiser who downloaded and used our West Kent Best Practice Guide and have good news to tell, please let me know via the feedback section to the right. By sharing best practice and good news we will help encourage others. "Hey, Fred, have you seen Annie Pierrepoint's new line in hand-stitched executioner's hoods She's got a lovely one in black velvet, with purple piping." "Yeah, I've got one. You can mix and match with the new range of nooses in the Lord Chancellor's catalogue." Once upstairs I felt quite at home and settled into a comfortable looking seat at the end of one of the tables close to the door. Sitting close to the door is an old Agent's trick as it enables you to escape from from approaching bores before they can trap you. The comfort didn't last long, however, when the Southern Zone Oberleutnant pulled rank and sent my scuttling down the room, to the last remaining seat, perched at the end of the top table and sandwiched between Edward Argar and James Tarbit. Now there are worse places to spend an evening than sandwiched between James and Ed, but having the three "naughty schoolboys" sitting in a row was bound to end in tears. James in the party's "do-gooder in chief" responsible for Social Action (or better known as 'nagging recalcitrant geriatrics into painting scout huts"). Ed, I have known and liked for years, but he is somewhat akin to the well scrubbed apple-bearing schoolboy who writes naughty words on the blackboard when no-one is looking. To cut a long story short, all was going well until the man from Sussex started talking about his KPIs. He had helpfully brought a document with 7 appended schedules to share with us. Two hours in my mind was drifting. To be honest I was stealing a glance at the party's co-Treasurer, James Lupton CBE, and thinking how absolutely normal he looked. Despite being on the Sunday Times Rich List, here he was, squashed onto the top table, eating double egg, ham and chips with the rest of us in "cholesterol corner". Then suddenly I was dragged back into reality. "I would now like you to turn to Schedule C where I shall deal with Conservative Member Penetration." There was a moment of delayed silence. "Now, as you will see from column two, the penetration in Chichester is far deeper than that in Crawley or Hastings where, for historical reasons, it doesn't go quite as far." I chanced a glance at Cllr Argar, to find him chuckling whilst hiding behind his papers. To my left James Tarbit was holding a poker face, but he clearly thought it was amusing to lean across underlining the word "penetration" - which got Argar sniggering even more. The lovely Julie Iles was by now making strange snorting noises and Richard Robinson was hiding behind his newspaper. Even the Southern Zone Oberleutnant was smiling - and he's had 30 years experience of hiding any emotional reaction to the absurdities around him. "I don't know what you're all sniggering at" said the man from Sussex. "Member penetration is a perfectly accurate phrase to measure what we have achieved." Am I wrong to be angry ? I am often outraged, more often than not for faux effect, but I am seldom angry. There is one area, however, when I find it difficult not to be angry - and that is when I see people using the Conservative Party for personal preferment, often to the detriment of those who do the right thing and play by the rules. Regular readers will know that we are facing a by-election. The selection process for this is open, fair and totally transparent. As always, we will follow the CCHQ Mandatory Selection Rules to the letter, they are clear and simple. 1. Both councillors who phoned to lobby have had little or no contact with the Office since their election, neither have found the time to attend a single constituency-wide campaign event in the last 2.5 years. 2. Neither of the people whose candidacies they were promoting are members of the Party (despite both receiving membership letters in the last 3 months). Neither have supported the Association politically, attended campaigning events, participated in the open primary or expressed any interest in our work. 3. 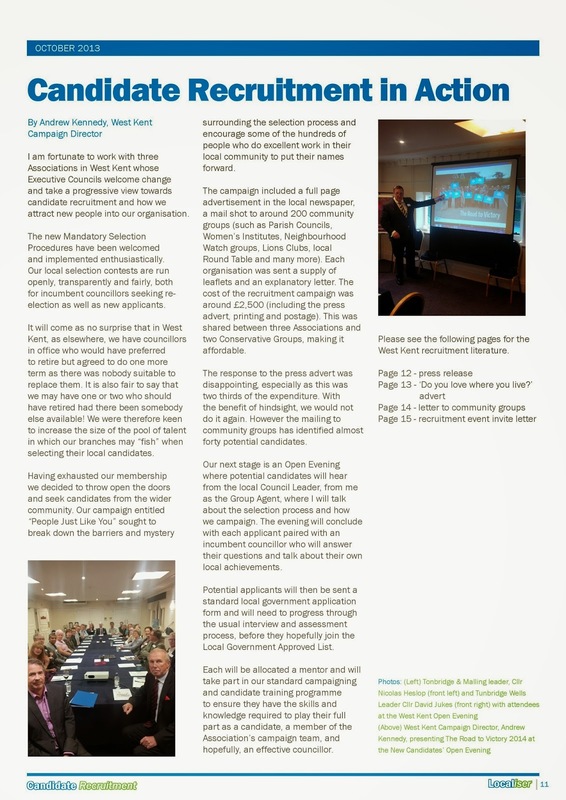 Despite the fact that both "wanabee" councillors received copies of our "Become a Local Councillor" recruitment leaflet, neither responded or showed any interest in our work or that of the Council. (a) if you were a councillor who has constantly and studiously over the last three years ignored every email or letter requesting help and support, would you really think it was appropriate to call the Agent on the eve of a selection and try to inveigle a position for someone you know? (b) do you really think it is honourable that a local candidate with a history of membership, hard work and activity should be shafted, so your friend can be imposed by some unseemly and backroom stitch-up? (c) do you not for one moment think that the people whose ambitions you are promoting should not have at least demonstrated the tiniest modicum of political interest beforehand, or in some way contributed to the Association's political goals? (d) do you not think the local voters might just react unfavourably if they found out a local candidate, with 40 years residency and a strong history of community activity, was side-lined so the relation of another councillor, who isn't remotely local, can be parachuted-in like some modern day carpetbagger. I have no issue whatsoever with newcomers, in fact we positively welcome them. I do, however, have a real problem with those who have eschewed opportunities to support the work of the Party at every opportunity, then expect us to dance with glee at some "Damascene-style" conversion on the eve of a selection contest. Such a sense of entitlement really has no place in a modern and transparent political process. I never forget that our primary purpose is to fight and win elections, but we need to raise funds to do so, and we need to bring people into our family - and social events are a great "gateway" towards that goal. So, for those who enjoy our events (including a growing band who come from outside the area because they have so much fun in West Kent) here are our social and fund raising programme up to (and slightly beyond) Christmas. For further information, click the link (where there is one) or call us on 01732 842794. Tickets £20 for cabaret and buffet. Children 15 or under: £15. Just home after a super fund-raiser for Tracey Crouch's re-election campaign in Chatham & Aylesford. 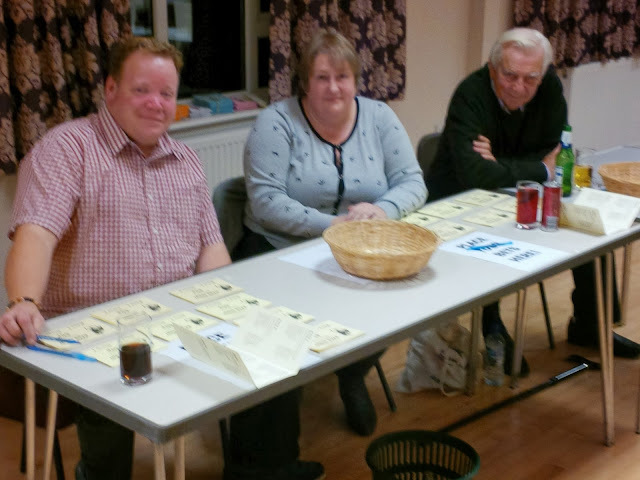 It was a good old-fashioned Race Night (on film) in a village hall; and we raised over £1000! Firstly around a third of those attending were not party members or activists - they were local people from the village where the event was held. We simply included a small advert in our recent In Touch newsletter (delivered 6 weeks ago) and they contacted us to book tickets. Most came because they wanted to help re-elect Tracey, who personal poll ratings are 12% higher than the Conservative Party's ratings in this constituency. Secondly, for the second week running we have raised in excess of £1000 from a £10 a head event (and this is after we paid £5 per head for catering plus the cost of hall hire). This is further evidence to support my theory that low-priced fundraising events not only attract more people, but they are then willing to spend more of the raffle. It was a good evening; I have a soft spot for C&A; Kent's smallest Conservative Association who deliver more leaflets, knock on more doors and make more Voter ID contacts every year than most of the rest combined. An Association whose sole purpose it to win elections, which they do without any of the infighting, rancour or personality feuds which affect most similar organisations. They are fortunate to have Tracey Crouch representing them in Parliament - and Tracey is fortunate to have such a dedicated, hard-working and determined team of foot soldiers fighting on her behalf. Joyce and Mike on the Raffle ! It's been a tough week; one of those weeks when I returned home late each night and wondered what, if anything, I had achieved. Now it's over, I can look back and appreciate we did quite a lot, but each day has been a slog, with very little light and shade. I have been to two long Executive Council meetings, one as the constituency agent the other as a guest speaker. The first was Tunbridge Wells, where he main item on the agenda was the West Kent Group / Campaign Centre and the other Faversham and Mid Kent. The discussion at TW was long and thoughtful - over two hours. Most people in the room contributed and made very good points. Some of the contributions were based on genuine misunderstandings, others on suspicion or apprehension of the unknown. Many people raised genuine concerns or points which require further investigation and will probably lead to changes before the final agreements are signed. The discussion, however, brought home to me that politics is a human business and the decisions we take affect people differently and often in an emotional rather than simply rational ways. As a "functionary" who is ultimately driven by statistics, I do tend to base my judgements on purely rationalist analysis; too often forgetting that for most people a degree of empiricism shapes their judgements, even if subconsciously. Another example of the above is an election - which ultimately are the reason we are here. Whenever a politician approaches an election they immediately start thinking about language, policy and messages; where my attention is on previous ballot box analysis, pledge targets and differential turnout. Perhaps this is why so few politicians are good agents and so few agents make good politicians; the skills are totally different and are seldom transferable. Politicians are, by nature, emotionally involved with the people they represent and the issues which affect their lives. For me, an election is about outcomes; how many pledges do we need to win; what percentage of those pledges need to vote and how we can maximise differential turnout. The real skill for all those involved is for each to recognise and respect the skills of the other. 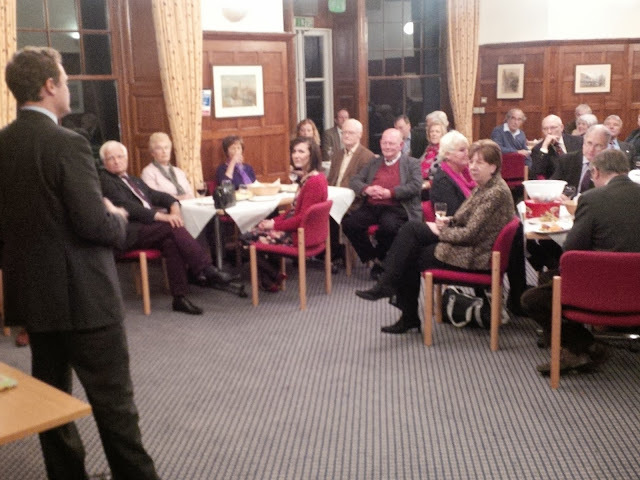 This week Tom Tugendhat provided dates for the first two events to allow members and donors an opportunity to meet and get to know each other. These are (with more to follow) a Cheese & Wine evening at Tonbridge Castle and Champagne, Carols & Canapés at Shipbourne. The Cheese & Wine event represented a significant breakthrough for us, too. This is the first event which we have advertised solely via our "social events" database - and sold all the tickets online, with payments by credit or debit card. Advertising the event and taking payments electronically has probably saved us £100 in printing and postage. The 2013 Christmas Draw is nearing its close - and this week saw "reminder letters" being sent to none responders. TW and T&M are both running behind where they normally are at this stage, which is hardly surprising as both Associations had late Autumn Appeals to help finance significant capital projects. Maidstone, which is following the West Kent Draw Best Practice for the first time, are already 50% up on 2012, and C&A are storming ahead with their best ever response. On Wednesday we took delivery of our latest Tunbridge Wells constituency--wide newsletter, with a common reverse and individual ward-specific fronts. The immediate response has been overwhelmingly positive. We also designed and printed two local newsletters for C&A wards - so 16 wards are delivering newsletters this week! And tomorrow (Saturday) we have our usual doorstep campaign teams working in Southborough and Chatham. Today, however, brought confirmation of the news I have been anticipating for a few weeks. One of our long-serving councillors has stepped down due to ill health. 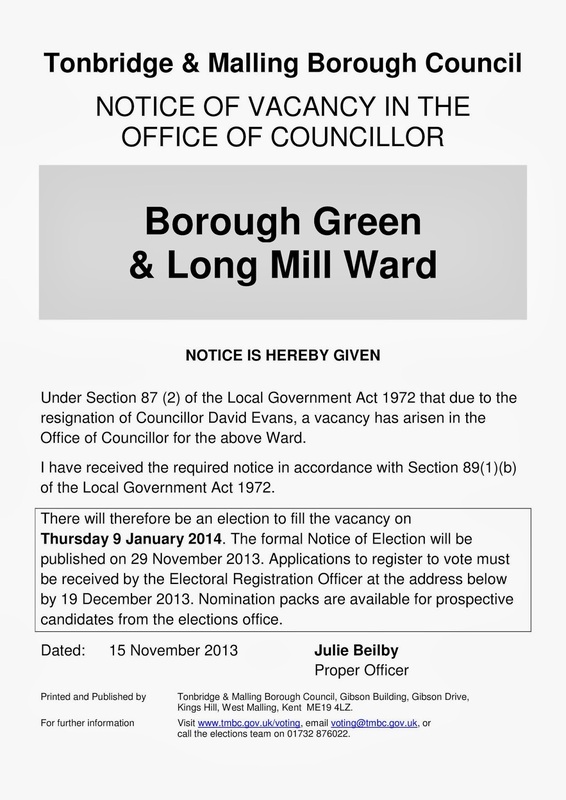 David Evans has represented Borough Green and Long Mill ward on Tonbridge & Malling Council for over 20 years. He has been in poor health for some time, but his condition has recently worsened and he was finding it a struggle to attend meetings and get out and about in his ward. Rather than hanging-on doing the minimum, he has decided to stand down; a brave and selfless thing to do given how much he enjoyed being a councillor and his deep commitment to public service. We all wish David the very best for the future. A by-election is always hard work, and one fought over Christmas is harder than most - but like an old warhorse, I can smell the gunpowder and I am already chomping at the bit. So apart from tomorrow's Race Night to raise money for Team Crouch - that's it from West Kent Towers! We have just taken delivery of our latest newsletter in Tunbridge Wells, which will be dropping through 40,000 letterboxes over the next few days. It is an A3 full colour newsletter; the inside pages are common across the constituency and deals with the Cinema Site - a thorny issue which has blighted the town centre for too long. We have launched a petition calling on the owners of the site to take action. The front pages are localised for each ward, which feature our local councillors and the work they are doing locally. Here is one example - it's the Broadwater ward edition highlighting Cllr Chris Woodward's already much publicised motorcycle raffle. This is the third newsletter we have delivered in TW since last May. No doubt when we go canvassing we will still get people saying, "you only come around when the elections are on!" 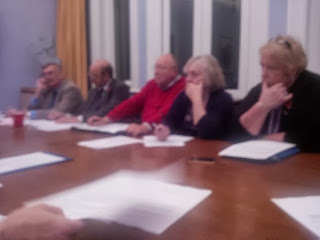 Last evening, after a very detailed and thorough discussion, superbly handled by the Association Chairman, William Rutherford, members of the Tunbridge Wells Executive Council formally voted to join the West Kent Group, bringing the goal of a modern, professionally staffed and properly equipped Campaign Centre one step closer. Thus far, three of the four Associations have voted in favour with the final one voting in ten days time. If all goes well, our new Campaign HQ should be up and running early in the New Year. Next week I have been invited to the Southern Region Chairmen's Dinner to speak about Grouping and the advantages it brings to local Associations and the campaigning strength of the party. 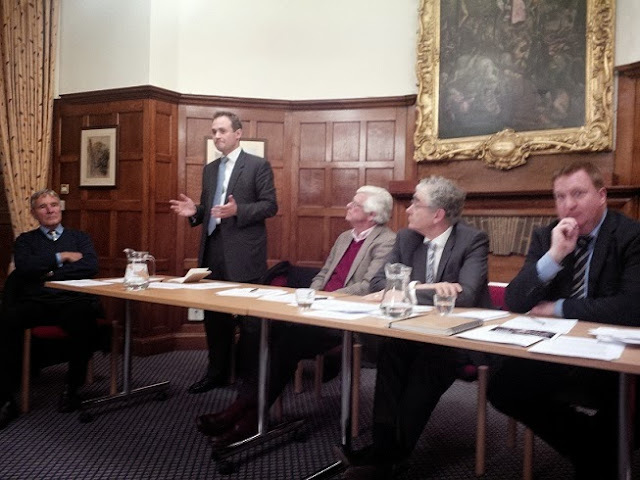 A few weeks ago I was invited to address a nearby Conservative Association on 'Improving Communications'. For some reason there was an internal debate about which part of the agenda I should speak under. The Chairman thought I was a "guest speaker" and should be invited to speak at the end where the MP would usually be. The Deputy Chairman Political disagreed; he thought my presentation was political / training and I should be half way through the agenda, tagged onto his bit. 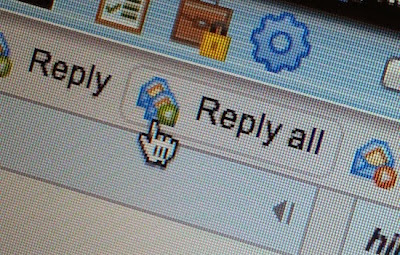 The ensuing discussion was conducted using "reply to all" facility, ensuring that everyone on the Executive Council mailing list was involved, including me (as they had sent the draft agenda to me by email too). The debate clearly exposed a divide in the ranks. The traditional members thought I should be awarded the honour of speaking after formal business, in recognition of my 'status'! The more progressive members viewed my contribution as technical, and as such should be in the political section of the agenda. I watched (and read) with amusement as both sides battered and contradicted each other with their own interpretations of rules and protocol. After four days and approaching 70 emails, someone suggested, "Why doesn't the Chairman phone him and ask him when he would prefer to speak?" A few hours later, my phone rang, and the Chairman asked that very question. I replied that, not being one for protocol, I would be happy to speak during the meeting as part of the DC Political report, but I really didn't mind one way or the other. After an hour another email arrived, this time from the Chairman. "Dear All, As suggested I have spoken to Andrew who said he would prefer to speak at the end, so we should respect his wishes." To this day I never let on - but I know the Chairman reads my blog and I hope his toes are curling with shame. Be sure your sins will find you out! The Conservative Party raffle really is an amazing thing and deserves a blogpost of its own. Last Friday, at the Ann Widdecombe supper, the "raffle" raised £360. There are probably several Constituency Labour Parties in the South East which do not have an annual income that high! The £360 represents about £4.50 per person. When you consider that 80% of the people there were "couples" with just one half of the couple purchasing, this indicates that many people must have bought £10 worth of tickets - a very generous contribution. Now we all know the psychology of a good raffle. Go around before the meal with the pink or yellow tickets (£5 a strip - none of this 20p a ticket nonsense, we're not Liberal Democrats) and send around two nice ladies (in our case Janet Sergison and Vivian Branson) to sell them. No-one will say no to two nice, kind ladies. Then, following the meal, send around the jovial 'salesman' with a book of blue tickets. By this time people will (a) have consumed several glasses of wine and be in a better mood (b) some will think that having both colours will double their chance of winning, and (c) many will have forgotten they have already bought and will purchase again. Now this "lottery psychology" is one thing - but it's even remarkable when one considers, (a) with perhaps one or two exceptions, the value of the prize is less than the value of the tickets you will have purchased (so, even if you win, you have made a net loss), (b) you secretly hope that you don't actually win as you really don't want or need a tin of Yardley Lilly of the Valley talcum powder, and (c) you have almost certainly brought a prize of better quality that the one you will take away with you. One of our branches has a formidable Madame Defarge like figure who is always in charge of the raffle. She sits just inside the door like Queen Bee, accepting contributions with a look which falls somewhere between pity and disdain. Each arrival nervously proffers their contribution and awaits her judgement. Anything considered "beyond the pale" is dropped into a box beneath the table and will next see the light of day at the jumble sale. Anything "too good" will be whisked off and will re-appear on the Bring-and-Buy table at the Christmas Coffee Morning. Over the years I have worked out the code; it's based on cache not cash - so Ferrero Rocher and le Piat D'or make it to the raffle, but Louis Jadot or Lindt would be whisked away for Christmas. Then there is the "winner's etiquette". Regardless of how much you have spent on tickets, or the value of the prize(s) you have brought - you must never go up for a second or third prize. Should you do so, no-one will actually say anything (we're far too polite to comment) but the low hissing noise coupled with numerous sotto voce repetitions of "he clearly hasn't been before" will leave the winner in no doubt that he has erred. Given most Tory raffles have 20 or more prizes, this will inevitably result in a painful chorus of "draw again" commencing half way through as second-time winners decline to claim their prize. One of my Associations has developed its own raffle protocol - something I have not witnessed anywhere else. Once you win a prize, you hand the remainder of your tickets to the person to your left, thus doubling their chances of winning. If they win, they hand all their tickets (including those which once belonged to you) to the person to their left, and so on. This neat trick saves you the social opprobrium attached to winning twice whilst ensuring someone else benefits from winning a bottle of Tesco Value Merlot. It's the Tory equivalent of Socialism - better known as the equal sharing of misery. And when all else fails - you can always re-donate your winning prize to the next raffle ! No-one will mind or say anything - as they're probably doing it too! We once had a bottle of De Kuypr Apricot Brandy that appeared at more branch events than Sir John Stanley (and had been around almost as long as him). It was like an old friend, always there - sitting grandly on the raffle table, its tatty label testament to hundreds of return car journeys. Then one day a random old biddy announced, "Oh lovely, I do like a drop of apricot brandy" and it was never seen again. 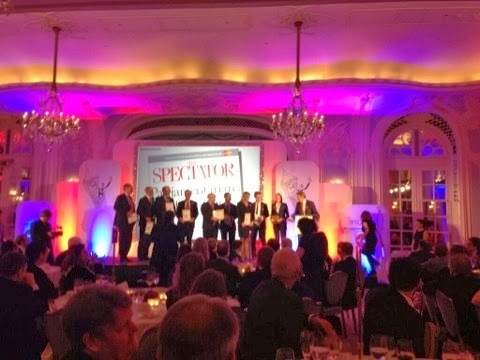 A few days ago I celebrated Tracey Crouch being awarded Parliamentarian of the Year by The Spectator. It looks however that the accolade has gone to her head. The following photograph shows the long-suffering Chatham & Aylesford Chairman, Adrian Gulvin, genuflecting at her feet whilst also cleaning her shoes. I do hope she doesn't expect Members of the Executive Council to follow suit - most would need a Zimmer Frame to get up again. And this morning, canvassing in the lashing rain in Horsmonden. That being said, given the ghastly weather, it is a tribute to the members and activists in Tunbridge Wells that we had a team of 14 out on the doorsteps. Now, please excuse me - I am heading home where I shall open a bottle of Claret, turn off my phone and try not to think about the Conservative Party until Monday morning. Just home, feet and legs aching, but that happy glow of a job well done. Tonight was the Management Committee's informal supper, with the ever popular Ann Widdecombe as guest speaker. In fact, with Jacques Arnold chairing the event, Tom Tugendhat attending his first Association function and Sir John Stanley also down to speak, I had more MPs, ex MPs and wannabe MPs than I knew what to do with. I decided to put them all on the same table, so they could spend they evening regaling each other with tales from the halcyon days. Ann really is great value; and one of those politicians who manages to connect with people at a different emotional level than most. About ten years ago we were running a campaign to save a local post office. It was on the edge of the Chatham & Aylesford constituency and its catchment area slightly overlapped into Maidstone, so I was able to ask Ann to help by posing for photographs with our local campaign team. She readily agreed, but added, "I am off on holiday tomorrow, so the only time I could do it would by at 3pm this afternoon." In the very limited time available we printed flyers and delivered as many as we could. Would anyone turn up at such short notice? Especially as it was a workday. We needn't have worried - they came in their droves, and they brought their friends and grandchildren too. Over 200 turned out. 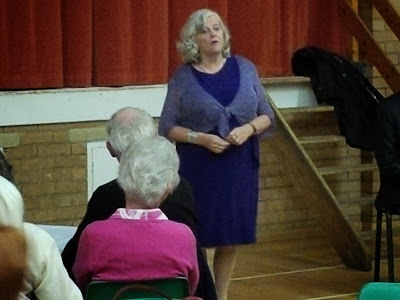 Not many MPs could enter a neighbouring constituency and draw a crowd of 200 on a weekday afternoon at just 2 hours notice, but Ann Widdecombe did. My issue with Ann isn't her politics (thought I suspect we are far apart on many issues), but it is the certainty of her views. The older I get the more tolerant, liberal and inclusive I become. In a world where people like to speak in terms of right and wrong, or black and white, I am increasingly seeing things in shades of grey. I cannot personally dislike opposition candidates simply because they wear a different coloured rosette. In fact, I often hear myself thinking, "If I was standing in his shoes, I would probably support that, too." But she was great value, and I agree with Sir John who, in his vote of thanks, said that she should be in the House of Lords. The evening was a great success in many ways, and a model of how I believe we should now raise funds. Being self-catered and in a village hall, we could keep the ticket prices as really low (£14 per person for two courses). The cooks (ten members who each agreed to cook a lasagne at home and bring it along hot) each received a complimentary ticket to cover their expenses; so the catering costs were minimal. With a low ticket price, more people could afford to come - particularly those who are perhaps "priced-out" of formal annual dinners at £45 per ticket. And they could afford to be more generous with raffle tickets. All together, after deducting costs, I suspect we raised £1,500 on an informal lasagne supper in a village hall. Yes, it's hard work catering for 100, setting up the hall and (worst of all) cleaning it and putting everything away afterwards. But £1,500 is a fair amount of money to raise from an informal lasagne supper. Most importantly, however, it was inclusive. No-one was sitting at home worrying about the cost of having to hire a DJ or if they could afford the tickets, and I hope no-one who came for the first time could possible walk away thinking "I don't think I can return; they're really nor people like me." A job well done. Looks like I have made someone happy! This email arrived earlier today. Very kind of her to write and to be told that I am doing something useful! I have just heard that Tracey Crouch was co-winner of the Spectator Parliamentarian of the Year Award earlier today. Tracey, along with the 15 'rebels' who voted against legislation to regulate the press, accepted the prestigious award at the Savoy Hotel this afternoon. Listening to Tracey's acceptance speech made me very proud that in some small way I was part of the team which helped her win her seat in Parliament. A life more ordinary ! After weeks of excitement with the parliamentary selection, life came crashing back to reality this week when the mundane chores of a constituency agent reasserted themselves. The day started at 8am with a call from a flapping councillor who feared he had missed his selection meeting the night before and would therefore be defenestrated. "What I am going to do, oh it's a disaster" he wailed, amid reading out long lists of important sub committees he serves on as justification for his diary malfunction. I put the poor chap out of his misery by reassuring him that the selection meeting was next week, not this. At least I made one person happy. Then it was a trip to West Kent Towers where I picked up the ballot boxes we used on Saturday and returned them to T&MBC (from whom we had hired them) and from there to Bookers Cash and Carry to buy "stuff" for Ann Widdecombe Supper on Friday. I suggested the Ann Widdecombe Supper as a 'Management Committee Event" and they all agreed enthusiastically. I think "agreeing enthusiastically" was all they thought they had to do and the "event fairy" (don't make up your own jokes please) would do the rest. I am, as always, grateful to the poor bloody infantry for baking lasagna, helping to set-up the room, running the bar and organising the raffle. With the honourably exception of the DC Political, Matthew CF Dickins, who willingly agreed to don pink marigolds, my pleas for help with washing-dishes after a dinner for 90 guests have fallen on deaf ears. Actually, in fairness, another Officer did offer to take a few dirty plates home and ask his wife to put them through their dishwasher, but I declined the on the basis that doing so would probably create more work than it solved. "I have helped establish a Group which is now seeking to form a committee to collate the views of others." My evening was finally occupied by an annual highlight; the General Meeting of the Kent Area Council. This is a committee of the "great and good" of Kent's political elite. Or perhaps a gathering of those too innocent or too inexperienced to say a firm NO when volunteers are sought. There are three representatives from each Association - making 51 in total. When added to the co-opted members, ex-officio members and various apparatchiks we have a committee of 70. Fortunately the South Zone Oberleutnant is never over ambitious in the putting-out of chairs. In fact he has an uncanny knack of putting out two fewer chairs than are ever actually required, giving the impression that more have turned up than were expected. This at least deludes attendees into thinking that it's an important meeting as more people have come than there are chairs. Sadly, few people ever attend a second time. Tonight was particularly poignant as we were saying thank you and goodbye to former MEP, Ben Patterson, who was stepping down after three years as Chairman. Ben informed us that he has served on the Kent Area Council for ten consecutive years, having first been elected in 2003. He regaled us with his full and detailed report of the last 12 months and some of the highlights of the past ten years. Then, with the faintest trace of white smoke, Alex King MBE. was elected as new Chairman. I give the last word to our SE Regional Chairman, Andrew Sharpe, who also attended tonight. In thanking Ben for his service, he referred to voluntary work for the Party to visiting Hotel California; you can check-out but you cannot leave. I didn't think it was appropriate to point out that the Eagles Don Heeley once indicated in an interview that Hotel California was inspired by the time he was a guest at the Camarillo State Mental Hospital. 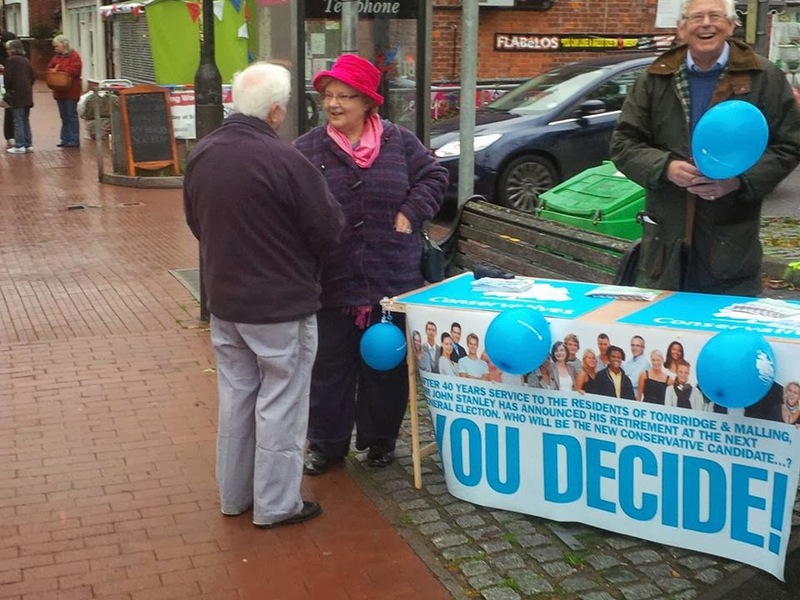 "I only discovered on BBC South East news last Friday that there was an open primary on Sat to choose Conservative candidate for constituency. I already had plans for that day so could not attend. But there was no publicity about this at all, nothing in local press, no leaflets through the door, no posters anywhere, so I don't see how you could claim this to be an 'open primary' for the whole electorate. I do realise that who the Conservatives choose as their candidate is up to them. That's fair enough & I do not claim to be a conservative or support your party, but please don't boast that you are being open & involving everybody when this is clearly not the case." 3. We sent out 5,000 mailshots, including notifying all Parish councils. Your own Parish Council Chairman booked to attend. 4. It was featured in the Courier, Kent Messenger, Sevenoaks Chronicle, BBC Radio Kent and BBC South East. The first public reports were in late September. 5. We had a website up and running three weeks before the event - which was visited by over 10,000 people. 7. We emailed every single person in the constituency who had given us their email address. I am sorry if you did not know, but I really don't see how we could have done more. I could have added, "and when we delivered a survey to you last year, you sent it back and ticked the box opting out of further email or SMS contact." For the record, here is a picture of our Information Stall on the High Street of the very village where the above complainant resides. If we were being "secretive" we were certainly going about it in a strange way! Just proves - no matter how hard you try, there'll always be someone who will complain! With the attention focused on the Open Primary, it's easy to forget that the basic 'day-to-day' functions of the four West Kent Associations were all continuing as before. The "elephant in the room" was receiving all the publicity (and rightfully so) but everything else was moving ahead in line with the diary; though in the shadows of the Big Event. For example, last week I was sent an email by the Ceri Pring at the Conservative Councillors' Association . This has the final copy of their LOCALISER magazine attached as a pdf, along with a note "hope this is OK!" I stared at it, wondering why on earth it had been sent to me and why I should be asked my opinion. Jon had spotted my "confused and bewildered" expression and wandered to my side of the desk to see what I was staring at. "Oh, it's your article on LG Candidate Recruitment" he said. I starred back, blankly. "You remember - you dictated it to me in September, before we went to Manchester for Party Conference...you were eating a Tesco Finest Ham Hock and Cranberry sandwich at the time - whilst airbrushing Medway Councillors." I am not sure if it was the ham hock and cranberry sandwich or the airbrushing of Medway councillors which jolted my memory, but it all came flooding back. The CCA were putting together a magazine on local candidate recruitment and wanted to feature our "People just like you" campaign. Anyway, here is my article, and below it a link for you to download and read the entire magazine, which offers lots of great advice on LG candidate recruitment. Live Blog from Tonbridge - as it happens!